I have to start by giving credit to that cover, it’s gorgeous and something about it speaks to my soul! I also just realized how much I’m adoring books from the imprint of Gallery Books, they publish strong, fresh, unique novels and I’ve especially loved their women’s fiction. If you haven’t checked them out yet I can highly recommend this book and I haven’t read any books by them that I haven’t really enjoyed. This was my first Reichert book, but it most certainly will not be my last! She combined a modern day, swoon worthy romance with an incredible setting and she totally captured my heart with her lovely writing style. Sanna has a simple, quiet life but she’s content. 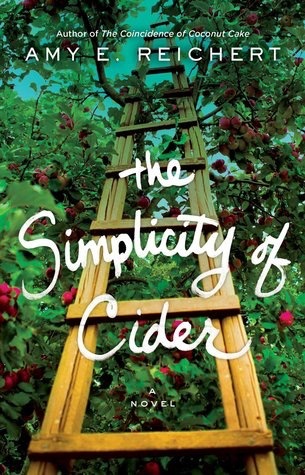 Her whole life revolves around her families orchard and she especially enjoys making cider. Issac and Bass show up at the farm looking for a place to spend the summer and she’s not exactly pleased when her father hires them. I loved Sanna’s cantankerous personality because I just knew underneath her prickly exterior there was a heart of gold. Isaac was hot AND an amazing father, this is where I swoon. His son, Bass is one of those kids that wiggle their way into your life whether you want them to or not and the blossoming relationship between him and Sanna was one of my favorite things about this book. Besides the lovely romance you have an idyllic setting, it was so enchanting. Learning about cider making was surprisingly fascinating and had me wanting to book a trip to an orchard in the fall. There was also just a hint of magic to the plot that added something truly special, who doesn’t like a little magic in their everyday life? I recommend this one to anyone wanting to make an escape from reality and enter a charming, quaint new place. I agree with you the cover is amazing! I love when a cover speaks to me! Great review Amy! Sounds like a book that I’d enjoy. I like the idea that the central character is a bit prickly. I’ve been reading too many novels where the women are crybabies. Oh she’s definitely not a crybaby haha! I had been eyeing this book on NetGalley and thinking about picking it up, it sounds amazing and I agree, the cover is gorgeous. Great review! Haha I bet! She seems sweet online, lucky you!! I’m currently reading it now, I really like food based fiction. I hope to read the author’s other two books down the road as well. Same here! I have the Lemon one just need time to get to it.